The blend of the English chic and true English beauty results something really wow-worthy and attention-grabbing. This time it is the star of the high fashion modeling with British roots Cara Delevingne and the London-based fashion brand Pepe Jeans. 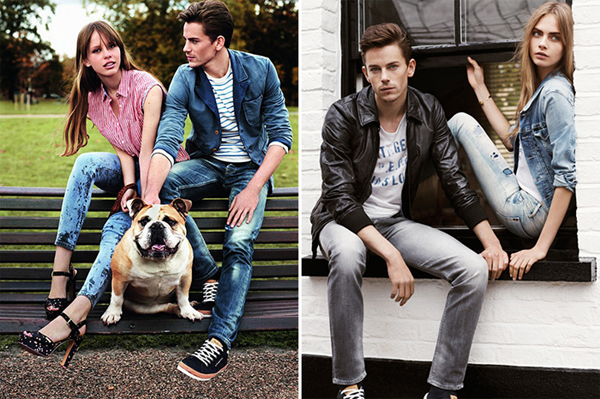 The popular high street label finally launched the Pepe Jeans spring summer 2013 campaign, which features Cara Delevingne. As the Pepe Jeans fashion label celebrates the 40th anniversary this year, so this particular collection returns to the roots of the label and delivers the key styles that best meet the Pepe Jeans philosophy. In the result we have a super trendy collection of denim items that come in the distinct colors, styles and patterns. Denim still remains one of the hottest trends for summer 2013 and it will be so in the future as well. This collection includes the basic jean garments such as the skinny jeans, chambray shirts, shorts, denim blazers and vests. Teamed with the printed or monochromatic smart shirts, your look will sure make you the center of everyone’s attention. Just like in the majority of the fashion collection, this one is where the preppy style meets punk and casualness. While denim remains the key theme of the collection, it still features the trendy checkered patterns, stripes and chic prints inspired by Andy Warhol such as the popular Campbell Soup Can print and Marilyn Monroe photo. As for the accessories, looks in this Pepe Jeans spring summer 2013 campaign are complemented with the stylish sneakers, eyewear, hats, heels and ankle boots.